The Kling Proton Therapy Center inSt. Louis installed the first Mevion S250 proton-beam therapy system. The system received clearance from the Food and Drug Administration in 2012. Widespread construction of expensive proton-beam therapy centers is galloping ahead, despite warnings from insurers and policy experts who decry the lack of evidence proving that the costly treatment produces better outcomes in prostate cancer patients, its most frequent use. At least a dozen new facilities, which can cost more than $200 million each to build, are on the drawing board or under construction. 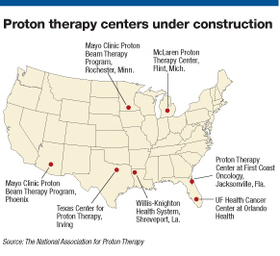 Their completion would nearly double the number of proton centers in the U.S. Advocates of the technology say proton-beam therapy spares healthy tissue and can improve a patient's quality of life and overall outcomes. But the procedure can cost twice as much as traditional radiation treatment. Critics say that financial incentives may be encouraging hospitals and companies to invest in the facilities and push patients toward proton-beam therapy when less costly and equally effective treatments are readily available. Although Loma Linda (Calif.) University Medical Center opened the nation's first proton center in 1990, only in the past decade has it become more widely used for treating prostate cancer, as well as cancers of the lung, breast, head and neck, and pediatric cancers. Hospitals and proton centers, well aware of skepticism, are seeking to research and quantify the benefits of proton-beam use in prostate cancer patients. Proponents say the technology eradicates tumors more effectively and has fewer side effects such as incontinence or impotence, which frequently affect men receiving more traditional radiation therapies. To prove those benefits, these providers are participating in prospective clinical trials, developing registries and conducting research to address questions from patients and insurers about the quality and costs of proton-beam therapy. Insurers, policy experts and professional societies in recent years have questioned whether proton-beam therapy is the most cost-effective treatment for prostate cancer. In addition, clinical practice is moving away from aggressive strategies to identify and treat prostate cancer. Fewer doctors are recommending prostate-specific antigen screening and more men are choosing active surveillance when the cancer is identified. Prostate cancer will be diagnosed in 233,000 men in 2014 and kill nearly 30,000, according to the American Cancer Society. Business plans behind many of the newer proton-beam facilities have assumed there will be a steady flow of prostate cancer patients, but that hasn't turned out to be the case. For example, the ProCure Proton Therapy Center, a joint venture between CentraState Medical Center in Freehold, N.J., and Somerset, N.J.-based ProCure, a private-equity operator of three proton centers, has struggled to bring in enough patients. The center, which opened in 2012, had projected it would treat up to 80% of its patients for prostate cancer. But this year it expects only 25% of its patients to come in for prostate cancer treatment. Concern about flagging volumes led the center to form a partnership with the New York Proton Regional Center, a group of New York-based hospitals that plan to open their own proton center in the next three years. As part of the agreement, physicians from Memorial Sloan-Kettering Cancer Center, New York University Langone Medical Center and three other hospitals will have staff privileges at the Somerset facility. Other centers also are forming regional partnerships, and some are purchasing less costly systems. Several years ago, Scripps Health and the University of California San Diego Health System announced plans to open proton centers. But when the Scripps Proton Therapy Center opened in February, UC San Diego Health System and Rady Children's Hospital, also in San Diego, had signed on as affiliate partners. “It doesn't make a lot of sense duplicating this expensive resource,” said Chris Van Gorder, president and CEO of Scripps Health. The $220 million center is owned by Advanced Particle Therapy, a San Diego-based developer of proton centers. Scripps provides clinical management and oversees medical services. 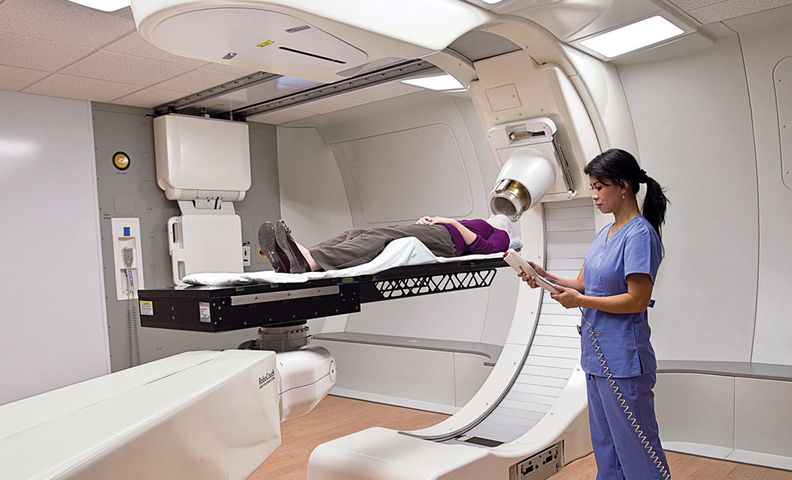 Advanced Particle Therapy, which partnered with Varian Medical Systems, one of several manufacturers of proton-therapy equipment in the U.S., is developing three other centers in partnership with other hospitals. Varian provided a $115 million loan to the Scripps center and will receive 4% of gross revenue for 35 years, according to securities filings. The center plans to treat 2,000 patients a year, with a significant percentage of its volumes expected to come from prostate-cancer patients. While most experts are quick to acknowledge that proton-beam therapy is beneficial for pediatric patients and those with cancerous tumors affecting the head and neck, those cases are quite rare and would not justify the cost of construction. It's the use of protons for early-stage prostate cancer that has been scrutinized most closely by insurers. Hospitals investing in proton-beam radiation therapy centers are gambling on clinical evidence that is still years away to justify their plunge into the expensive technology. Blue Shield of California and Aetna revised their coverage policies in 2013 around the latest indications, declining to cover proton-beam therapy as a treatment for localized prostate cancer. Cigna this year reaffirmed its position that proton-beam therapy is not considered medically necessary to treat prostate cancer and will not be covered. An Aetna spokeswoman said the company's policy revision followed a 2013 statement from the American Society for Radiation Oncology that said the effectiveness of proton-beam therapy for localized prostate cancer when compared with other treatment options was unclear, and that it should not be routinely used on patients. Aetna said it does support allowing coverage when providers capture evidence from patients by participating in clinical trials, or when they enter results into registries to determine the treatment's long-term outcomes. Research to date has questioned whether proton-beam therapy leads to better outcomes for prostate-cancer patients. A 2012 study published in the Journal of the National Cancer Institute found proton therapy led to a modest reduction in side effects for the first six months after treatment, but found no differences when comparing the treatment to traditional intensity modulated radiotherapy after one year. The proton therapy cost 70% more than traditional treatment, the study noted. “The relative reimbursement of new medical technologies needs to be considered carefully so that physicians and hospitals do not have a financial incentive to adopt a technology before supporting evidence is available,” the study's authors wrote. To counter their critics, proton centers are moving forward with studies and clinical trials that they hope will provide data showing that proton-beam therapy is more beneficial for patients. Research conducted by the University of Florida Proton Therapy Institute in Jacksonville and published in March in the International Journal of Radiation Oncology assessed five-year outcomes from three non-randomized trials that followed 211 prostate cancer patients treated with proton-beam therapy. The prospective cohort study, which did not have a comparison arm, claimed the treatment compared favorably with other radiation modalities used to treat prostate cancer. While research is underway, some proton center medical directors said they plan to continue to treat patients with early stage prostate cancer, a population that is significantly larger than the number of pediatric or head and neck cancer patients who may benefit from proton therapy. Half of the 750 to 800 patients treated each year at the University of Florida Proton Therapy Institute are prostate cancer patients. Other centers such as the Mayo Clinic, which plans to open proton centers in Arizona and Minnesota within the next two years, will not treat low-risk prostate cancer patients. Mayo anticipates that up to 15% of its proton patients will be men with immediate-risk or high-risk prostate cancer, however. Even centers that plan to offer proton therapy to low-risk prostate-cancer patients said there is a need for data that compares proton therapy to IMRT and brachytherapy, the other radiation methods used to treat prostate cancer. Many centers, including a small number of academic medical centers and well-known health systems, are establishing patient registries and participating in clinical trials to make the case to insurers that while the technology is expensive, it may help reduce overall costs and improve patient outcomes in the long run. A randomized clinical trial led by Massachusetts General Hospital in Boston, along with other centers will compare proton-beam therapy to IMRT in 700 patients with low- or intermediate-risk prostate cancer. In the interim, some hospitals are looking at installing less costly technology to supply proton-beam radiation. American Shared Hospital Services, a publicly owned company that leases medical equipment to hospitals, inked agreements for centers associated with First Coast Oncology and Orlando Health, both in Florida. The company owns a roughly 1% stake in Mevion Medical Systems, a Littleton, Mass.-based manufacturer of the lowest-cost proton equipment currently available, according to securities filings. Other centers such as the one at Barnes-Jewish Hospital in St. Louis purchased its equipment directly from Mevion. The Mevion system's smaller cyclotron costs around $30 million, compared to $150 million to $250 million for a traditional cyclotron. It also takes up significantly less space. However, the Mevion system treats only one patient at a time, compared with the $220 million Scripps center, which has the capacity to treat five patients at a time. Regardless of cost, hospitals have a vested interest in ensuring that their centers are successful. While some centers are hundreds of miles from the nearest competitor, other markets will soon be quite crowded. Florida, for instance, is slated for three proton centers, which the owners claim are justified by local needs. “We're not trying to be a destination,” said Dr. Scot Ackerman, medical director of First Coast Oncology, a private radiation oncology practice in Jacksonville, Fla. Its proton center will open this year. Proponents also agree there is a need for better education and research around proton therapy. At a national conference in late March, a group of proton centers released a model policy that provides a list of indications that they believe insurers should cover, including prostate cancer. “It's exciting new technology, but it is costly, so we need to take a measured and reasonable approach and study it in depth and find out if it works or not,” Foote said.